Review: Palm, 'Rock Island' Palm claims to play "rock music backwards," though it feels more apt to say the group turns rock tropes inside-out. Palm claims to play "rock music backwards," though it feels more apt to say the group turns rock tropes inside-out. Sometimes its songs foreground bass and drums while its two guitarists establish rhythmic patterns; sometimes members modify their instruments until they bear only a passing resemblance to their expected sounds. I've seen more than a few YouTube comments comparing the band's music to a bad acid trip, but I've never actually heard anything aggressive or confrontational in Palm's experimental approach. Nowhere is this more true than on Rock Island, the band's sophomore album, which shows a sharpening of the band's ability to turn otherwise ragged riffs into crooked smiles. The band has honed a delicate balance of curiosity and precision over its past releases, including a handful of EPs and its thrilling debut album, 2015's Trading Basics. Its performances, meanwhile, are mesmerizing, with each member enacting a studied intensity that gives way to mind-bending fun. Drummer Hugo Stanley and bassist Gerasimos Livitsanos lock into unwieldy grooves while Eve Alpert and Kasra Kurt's guitars might switch from sounding like crunchy punk rock to being dead ringers for steel drums. Rock Island takes these tendencies to new heights. In the studio, the band used a guitar and the drum kit as MIDI triggers, giving them the ability to swap out studio sounds and rhythms for samples. 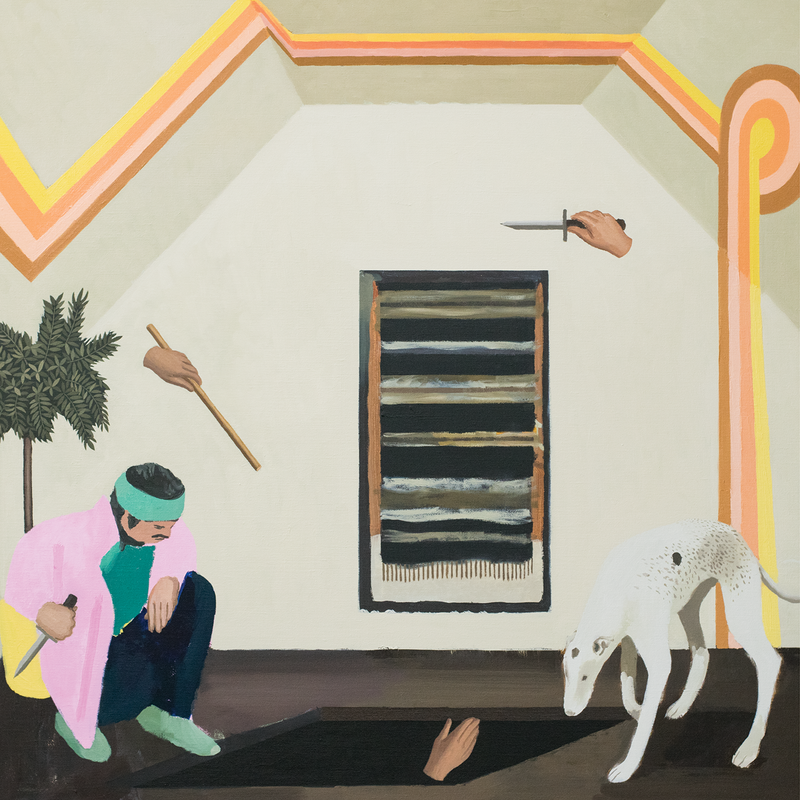 Tracks like "Dog Milk" combine Stanley's live with electronic drums to dizzying polyrhythmic effect; some of the samples in "Color Code" and "Theme From Rock Island" lend the tracks a delightful kitschiness. That jovial mood also comes through elsewhere, too. Kurt and Alpert's vocals, especially on tracks like "Composite" and "(Didn't What You Want) Happen," give off soothing Brian Wilson-by-way-of-Animal-Collective vibes. Or take "Heavy Lifting," which opens with a minute and a half of sunny rock and Alpert singing a blissed-out pop melody, then turns to three minutes of interlocking rhythms and riffs that expand with prog-rock urgency. The whole thing feels joyous and exploratory, a perfect example of Palm's ability to chase weirdness without leaving its audience behind. Palm has pulled off an impressive trick: Rock Island is its most accessible release yet, but never sacrifices its beloved experimental edge. It's a testament to the band's years of collaboration and ceaseless desire to approach rock songwriting and performance from untested angles. The band may ignore most rules of rock and roll, but one maxim stays intact: This whole thing is supposed to be fun.